Get your money up to 2 days sooner,2 keep your money secure, and avoid check-cashing fees! Plus, there’s no additional fee to enroll. Direct Deposit your paycheck, government benefits payment, and tax refund. Learn more about Paycheck and Government Benefit Direct Deposit. 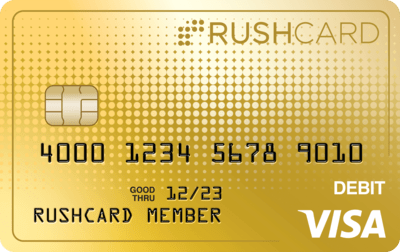 Load cash to your RushCard at thousands of retail locations nationwide while out on the go, shopping, or anytime that works for you. You can add up to $2,999 total per day. Bank transfers are no problem. If your bank offers ACH electronic money transfers from your checking or savings account, you can transfer funds to your RushCard. If not, you can link your bank account to your PayPal account and transfer funds from PayPal directly to your RushCard.